1. To be eligible, you must be an elementary, middle or high school student residing within the Lenawee Intermediate School District. High school seniors are not eligible after graduation. 3. Special talent and a career interest in music and the performing arts are considerations for this scholarship; financial need is not a factor. 4. Only one application per individual per season. 1. Submit your completed application to the Foundation through Lenawee Intermediate School District, 4107 North Adrian Highway, Adrian, Michigan 49221. The deadline for this scholarship application is March 31st. Late or incomplete applications will not be accepted. 2. A selection committee from the Wilson Foundation reviews the qualified applications and selects those to be awarded scholarships. The criteria for selection are the student’s potential talent and the level of dedication to the studying of music or the performing arts. On a separate sheet of paper please give us a BRIEF statement about yourself including how long you have been interested in this field of study and how you feel you would benefit from this camp. This statement MUST BE hand written by the student. You must also submit a letter of recommendation written by a teacher or other individual (not a family member) who has witnessed your pursuit of your field of interest. This letter should be written for this scholarship application. You MUST attach a copy, from the camp, of the actual cost – your scholarship will not be processed without this information. You must include a copy of your acceptance letter if you have one. If you have not received this yet you will need to send it at a later date. 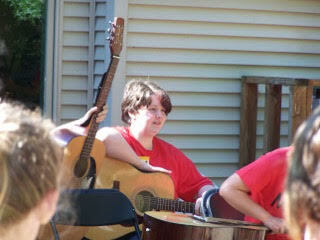 At least 75% of the classes being taken at the camp must relate to music or the performing arts. The amount of the scholarship awarded will be up to one half of the cost of the camp’s tuition (cost is based on tuition only – any other costs such as clothes, extra lessons, personal accounts, etc. will be participant’s responsibility). The total amount awarded in the program will depend on the number of successful applicants. The Lenawee Intermediate School District Foundation will pay the scholarship award directly into the student’s tuition account at the approved camp.